Signed Impressionist Painting of Elephants and Landscape, "Elephant Ploughing"
Thai artist Chirawat reflects on the relationship shared between humans and elephants in this painting, depicting a team of Karen hill tribe farmers working with elephants to plough a field. 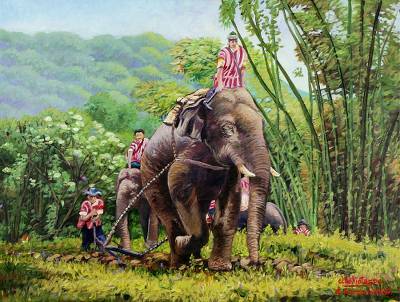 An important part of daily life in the Chiang Mai hillsides, this domestic scene is realized in the impressionist style. The artist surrounds the subjects with a green forest against a beautiful landscape.